Jane Grigson credited Elizabeth David with introducing Brits to courgettes, asserting "She was the first to relieve courgettes of their italics". David wasn't actually the first to offer a recipe to the British market but before David wrote her book Mediterranean Food in 1950, courgettes were largely unknown of here. The Cucurbit genus came to us mainly in the form of marrows and, if you had access to a greenhouse, there were cucumbers and melons to try growing. It is only in the last few decades that we have also come to appreciate the merits of pumpkin and squash. If only we hadn't been focussed on growing those large, watery marrows we wouldn't have taken so long to appreciate the courgette. These days, there are specific seed varieties bred for courgette and marrow production although they come from the same family and a courgette can still grow to marrow proportions if you let it. At this time of year those of use who grow our own can never get enough recipes for using courgettes. Fruits the size of stubby pencils can swell to monstrous proportions within 2-3 days if you don't keep a close eye on them. If growing is not your thing you'll want to skip to the end of this piece for the recipe because this is the one time of year when I have the time and opportunity to share some gardening photos taken over the past week. If you do read on, however, you will find links to earlier recipes you might like. I never seem to get around to writing about the allotment in June or July. There's far too much planting and picking to get time to write about it. Looking back, it's May and August when I feel the urge to tell you what's happening on Plot 45. Unlike this time last year, there's no denying there's a touch of autumn in the air. The first sign for me is a change in light rather than temperature, but cooler nights have definitely arrived. This time of year suits me, not least because I can sleep at night. Growth has slowed down a bit, no more frantic picking of luscious raspberries before they tip over from perfect to spoiled in the space of 24 hours; no more trying to hide my precious blackcurrants from marauding birds; and no more livid scratches on arms earned reaching for the last of those sweet golden gooseberries... Until next year. Not that I'm finished with raspberries yet. Autumn Bliss is just getting into it's stride, but it's slow-pick-pick-slow for autumn fruiters. They may be less prolific than the high-summer berries, but their deeper flavour more than makes up for that. It's earlier than last year but a reminder of Blueberry & Raspberry Mascarpone Pots seems appropriate now that we may be gathering the last of the berries and you need to make a little go a long way. And now come the borlotti beans. Definitely a harbinger of late summer. 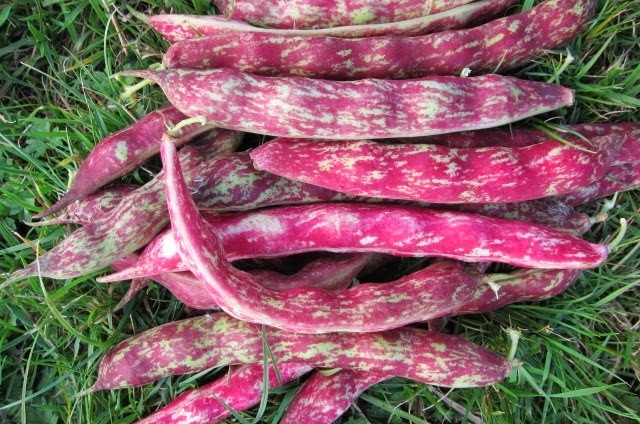 My favourite way of using them freshly picked is in, punchy, Borlotti Bean Bruschetta. Dried in their pods for a couple of weeks, they store really well for re-hydrating and adding to soups and stews when the temperature really drops. This year's crop was grown from a handful of beans squirrelled away last autumn. The wigwams of lush green growth hide long, broad green pods which turn to deep pink with white marbling maturing through to purple/red if you leave them long enough before picking. Once you can feel fat beans inside the pods, get picking. This week's haul of late raspberries, juicy wild blackberries and unknown varieties of plum and apple makes it difficult to argue summer is nearly over. It is the perfect excuse for looking to this Almond, polenta and lemon cake with Blackberry Compote or this Plum Tart, or even Raspberry Ripple ice cream if you have enough berries. 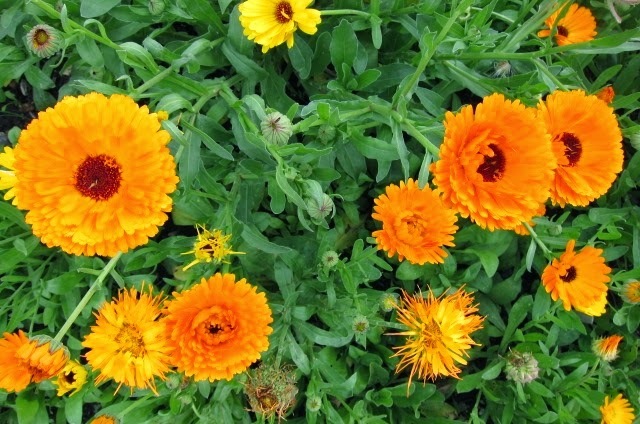 Growing calendula (marigold) on the allotment is the best way to hold onto summer. It's the plant that just does not want to stop flowering. Once planted, it will also never go away as it self-seeds prolifically. Having to weed out new plants that come up just where you don't want them next spring is a small price to pay for the joy of having the yellow/orange blooms right through into late autumn. Growing biodynamically, I'm constantly on the look-out for slime trails and white dust in the cucurbit patch but courgettes and pumpkins are going strong and, incredibly, are pretty much free of slug/snail damage and powdery mildew this year. Once courgettes get going they come thick and fast so here are a couple of favourite recipes: a surprisingly creamy Courgette Soup and Courgette, lemon & thyme linguine. Happily for us Brits, by the time Elizabeth David was ready to publish here book French Provincial Cooking in 1960 she could write "Enterprising growers are supplying us with little courgettes as an alternative to gigantic marrows". So, here's another recipe. Fried courgettes or more properly Zucchini Scapece (meaning marinaded in vinegar and mint) as it is surely the Italians who are the courgette's greatest appreciators. It's based on the the recipe in Claudia Roden's The Food of Italy. My copy is the original 1989 version so hopefully the recipe is in the new updated version published earlier this year. I know in Italy it would be served as a separate course but I also like it alongside roast lamb. Salt the sliced courgettes lightly and leave them to release water for up to an hour (if the courgettes are small you won't need to salt them but do let them release their water). Pat dry thoroughly with kitchen paper. Use enough olive oil to just cover the bottom of a large frying pan. Add one clove of peeled garlic and heat to soften and brown lightly before removing and discarding it. Fry the courgette slices in batches to brown on both sides. Drain on kitchen paper. Layer in a serving dish with the chopped garlic, chilli, mint and vinegar. Serve at room temperature.